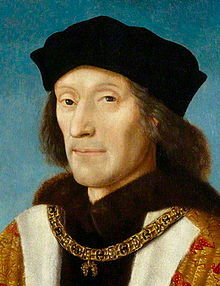 Henry VII (1457–1509) o Myghtern Pow Sows hag Arloedh Wordhon a-dhia 1485 bys termyn y vernans. Ev a veu genys yn Pennvro, Kembra; y dhevedhyans o Frynkek, Kembrek ha Sowsnek warbarth. Tas Henry o Edmond Tudur, Yurl Richmond, a verwis awos an Pla Meur kyns dineythyans y vab. Dama-wynn Henry Tudur o unn kyns myghternes Pow Sows, Katrin a Valois. Hag eev flogh, y triga Henry yn Breten Vyghan. Yn 1485, ewnter Henry, Jasper Tudur, a hembrenkyas trygh sewen yn Kembra. An myghtern y'n eur na, Hykka III, a fethsons ynsi orth Kas Bosworth, ha Henry eth ha bos myghtern. Arthur (1486–1502), kynsa gour Katrin a Aragon. Margaret Tudor, Myghternes Alban (1489–1541). Henry VIII a Bow Sows (1491–1547). Maria Tudur, Myghternes Pow Frynk (1496–1533). Edmond Tudur, Dug Gwlas an Hav (1499–1500). Diwettha chanj an folen ma a veu an 11 Meurth 2013, dhe 10:15.